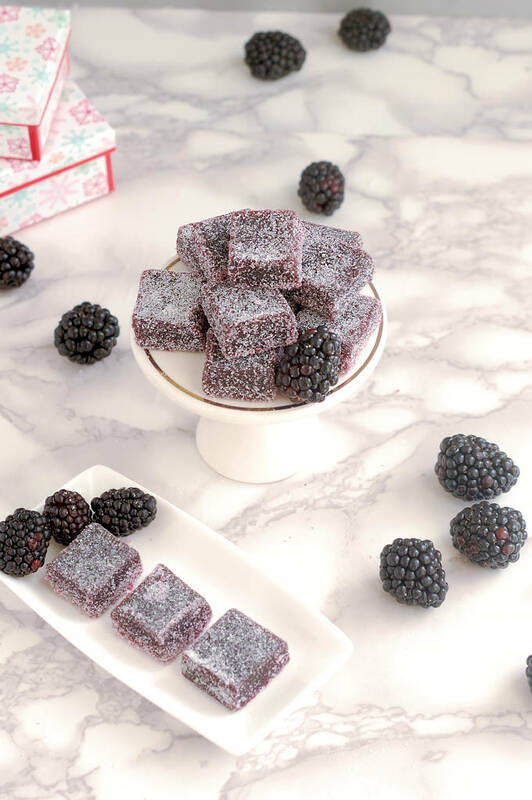 Blackberry Pate de Fruit are soft, melt-in-your-mouth jelly candies made with real blackberry juice. The candies are rolled in vanilla sugar for a pretty and tasty finish. 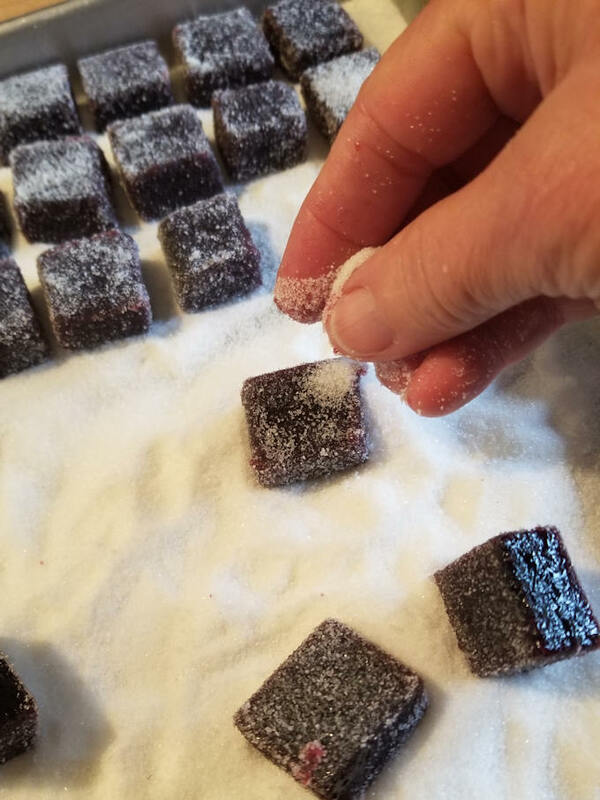 Pate de Fruit is a wonderful introduction to candy making. The french name sounds fancy, but they are, basically, fruit jellies. As long as you use real fruit puree, classic pectin and boil the puree to the correct temperature you should have no problems with this recipe. It’s possible to use almost any fruit puree to make pate de fruit. But fruits do have varying levels of natural pectin and that can affect how the fruit gels. 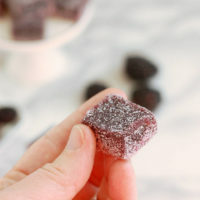 I tried 3 times to make pate de fruit from pomegranate juice without success. I may revisit the idea in the future because I love the flavor of pomegranate. But pomegranates have very low natural pectin level so I need to work on the recipe a bit more. 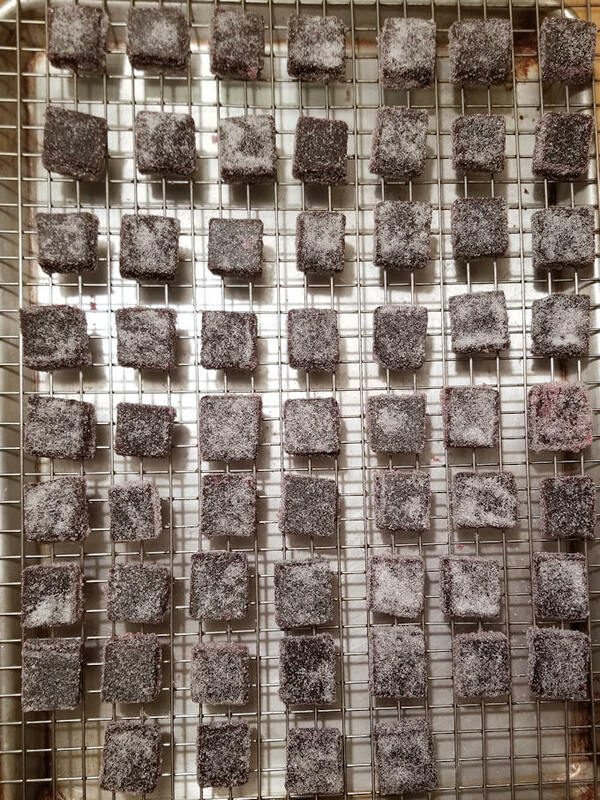 I’m happy with these Blackberry Pate de Fruit. 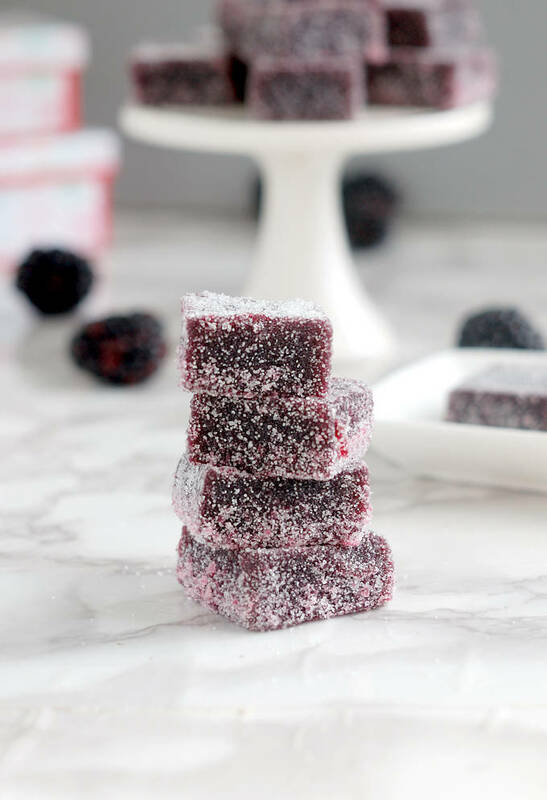 Blackberries are available year-round in the frozen food section so this is a very accessible recipe. I love the way these candies look like little jewels when they’re all lined up in a box. They make such a pretty gift from the kitchen. Use either frozen or fresh blackberries to make the puree. Make sure to strain the puree to remove the seeds. 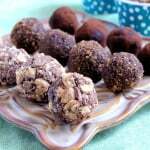 I tested this recipe with the Classic Ball Pectin. Pectin can vary by brand and type so I don’t recommend substituting another type of pectin unless you are already familiar with the product. Whenever I use the seeds from a vanilla bean I save the pod to make vanilla sugar. Simply place the pod in a canister of granulated sugar and let it sit for a few days. As you use the vanilla sugar replace with more granulated sugar. Add pods as you use them. To make a quick vanilla sugar scrape the seeds from a vanilla bean and rub the seeds into the granulated sugar. Save the pod and start a canister of sugar for future use. 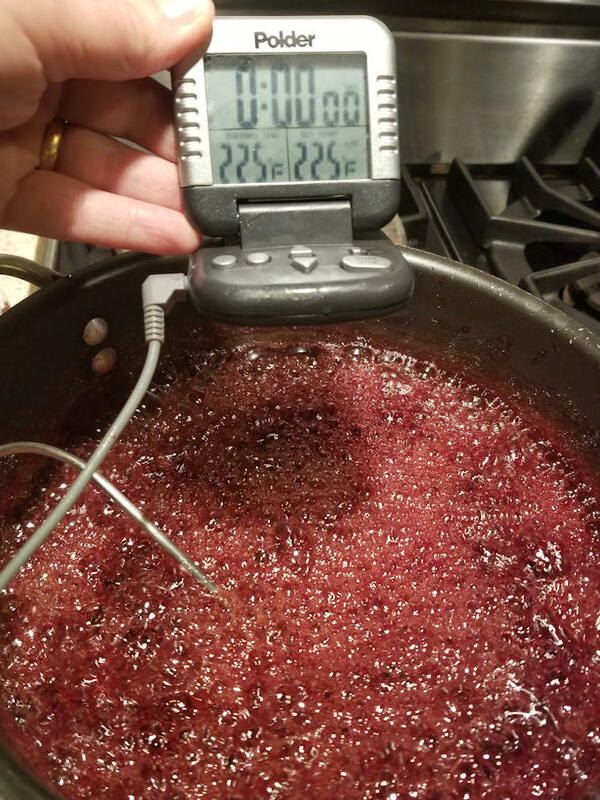 Use a candy or probe thermometer to monitor the temperature of the puree. 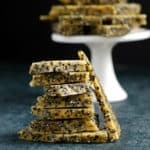 Leave the coated squares out on a rack for a day to harden the sugar crust a bit. This helps prevent sticking when they are packed. The candies will keep in a covered container indefinitely. 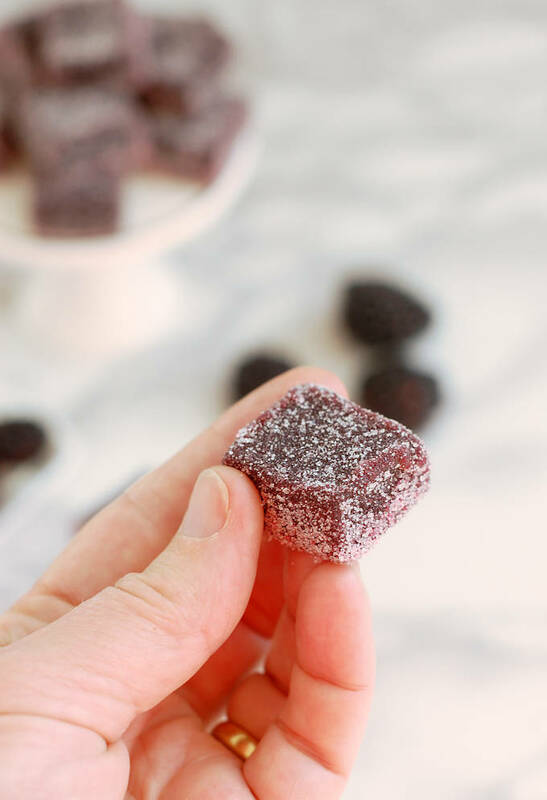 Soft, melt in your mouth jelly candies made with real blackberry juice. 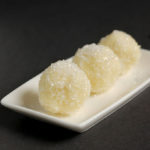 The candies are rolled in vanilla sugar for a pretty and tasty finish. 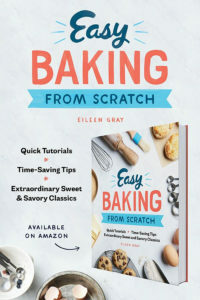 Spray an 8" square cake pan with cooking spray (not the baking spray with flour added). Line the pan in both directions with parchment paper. Spray the paper too. Set the pan aside. In a small bowl, whisk together the 2 oz of sugar and the pectin. Set aside. In a medium sized saucepan, bring the blackberry juice to a boil. Whisk in the pectin/sugar and return the mix to a boil. Add the remaining sugar and the corn syrup. Bring the mix to a boil. Stirring often, cook the mix to 225°F, about 10-15 minutes. Turn off the heat. Add the lemon juice and stir until it settles. Pour into the prepared pan. Set the pan on a level, heat-proof surface and let it cool completely and set, about 6-8 hours. Generously sprinkle a sheet pan with a layer of vanilla sugar. 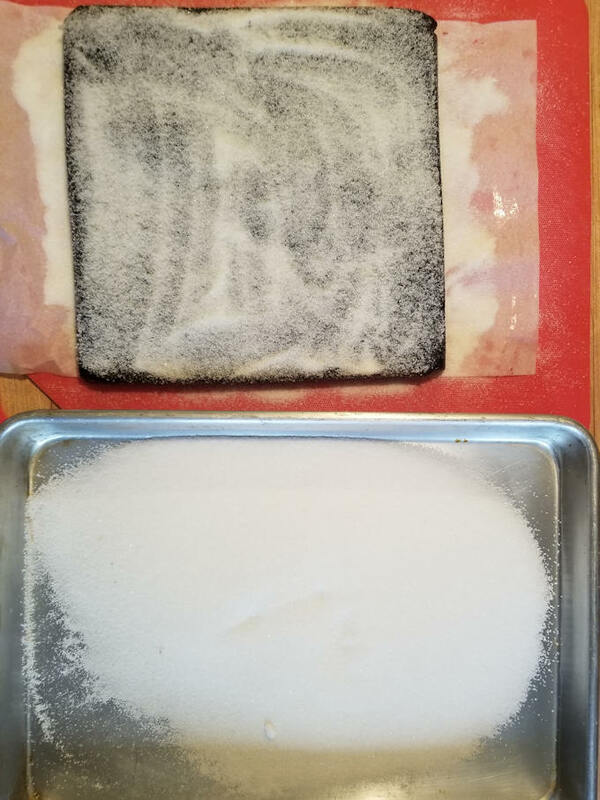 Sprinkle a cutting board with a layer of the vanilla sugar. Place the rest of the vanilla sugar in a small bowl. 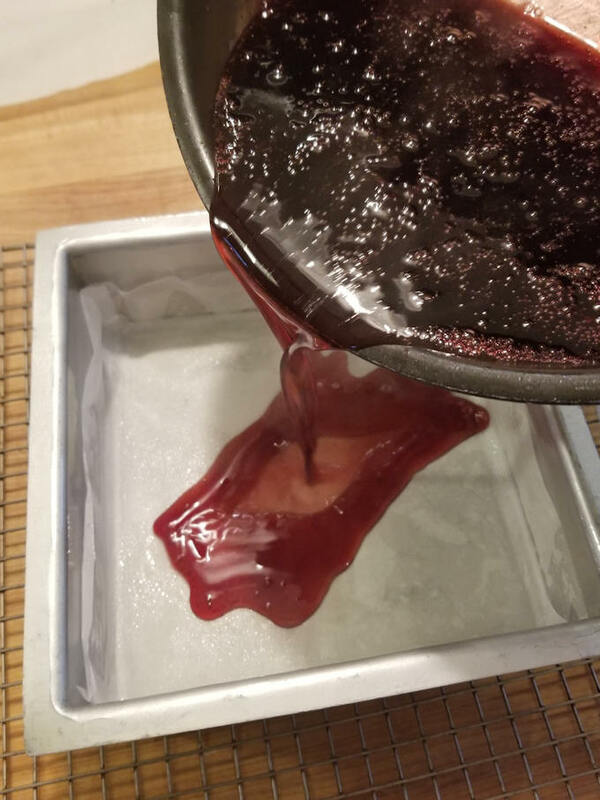 Use the parchment paper to lift the jelly out of the pan and flip it onto the cutting board that has been sprinkled with vanilla sugar. Peel the paper off the back of the jelly. Sprinkle the top of the jelly with a layer of vanilla sugar. To prevent sticking, lightly oil the blade of a long knife. 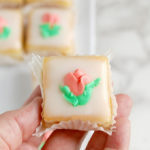 Cut the jelly square into 1" lengths, gently separately the pieces as they are cut. Cut each length into 1" squares. 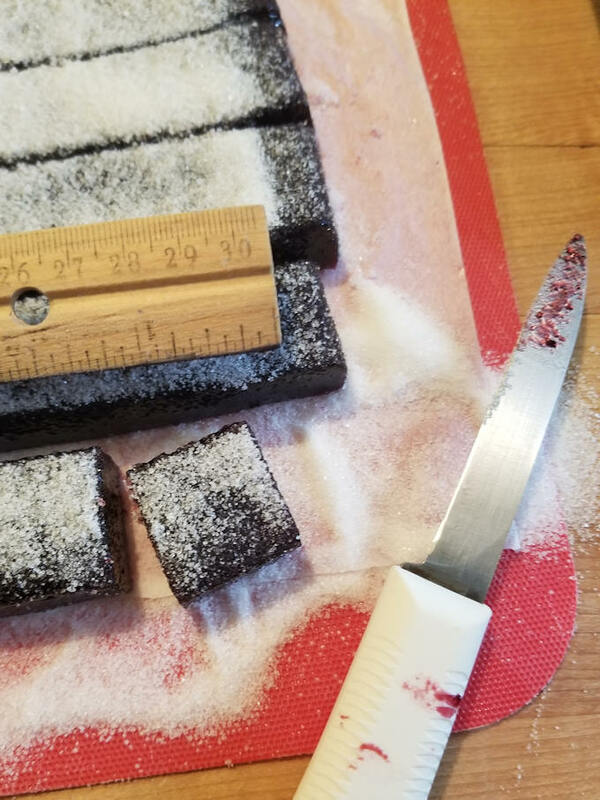 Roll each square in sugar as it is cut and line it up on the prepared sheet pan. You should have a total of 64 1" squares. 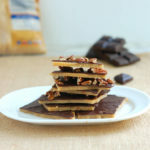 Sprinkle a layer of sugar over the candies then transfer them to a cooling rack set over a sheet pan. Leave the candies on the rack, unwrapped, at room temperature for 24 hours to dry the coating. Pack the candies in a covered container or a box, sprinkle a little sugar or use waxed paper between the layers to prevent sticking . 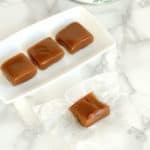 I tested this recipe with the Classic Ball Pectin. 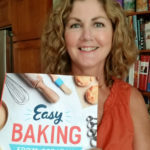 Pectins can vary by brand and type so I don't recommend substituting another type of pectin unless you are already familiar with the product. 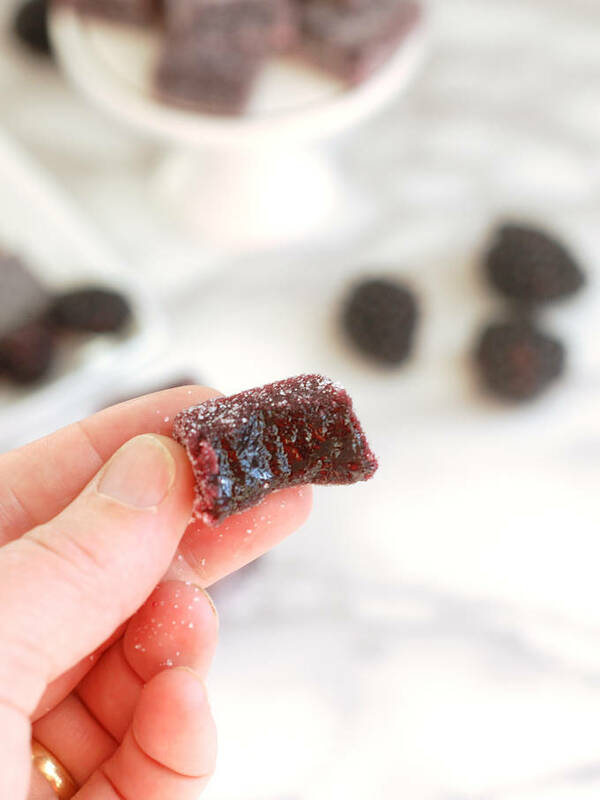 To make blackberry puree: Completely defrost two 16oz bags of frozen blackberries. Puree the defrosted berries in a food processor or blender until smooth. Strain the puree through a fine mesh sieve to remove the seeds. To make vanilla sugar submerge a fresh vanilla bean in a bin of granulated sugar for several days.